2015 Panini National Treasures Baseball Factory Sealed Hobby Box. Thank you from Queen City Sportscards, wwwqcsportscardsnet. Configuration: 1 packs per box. Find the Rookie Material Signatures checklist with more than 80 Rookies, covering one of the hottest rookie classes in recent memory! Find Kris Bryant, Addison Russell, Francisco Lindor, Jorge Soler, Joc Pederson, Rusney Castillo, Byron Buxton, Jung-Ho Kang, Joey Gallo, Preston Tucker, Carlos Rodon, Noah Syndergaard, Matt Duffy, Steven Matz, Chris Heston, Jake Lamb and Billy Burns! - NEW to 2015 National Treasures, Glory of their Times and Glory of their Times Cuts. Find an impressive checklist of baseball legends featuring a jersey or bat piece, sequentially numbered to 99 or less along with a parallel that also features a cut-signature, sequentially numbered to 5 or less! - NEW to 2015 National Treasures, Flag Silhouettes! Find an impressive roster for this amazing insert set that highlights the entire flag patch from a game-used jersey. Look for Carlos Correa, Preston Tucker, Steven Souza, Jung-Ho Kang, Jose Abreu, Lance McCullers, Matt Duffy, Luis Severino, Maikel Franco, Mark Buehrle, Omar Vizquel, Vladimir Guerrero, Adam Jones, Andres Galarraga, Barry Bonds, Cal Ripken, Joey Gallo, Juan Gonzalez and others, all 1-of-1s!! - For the first time, find oversize jumbo cards that feature unique and rare memorabilia in National Treasures! Collect Stirrups, sequentially numbered to 5 or less, of Lou Gehrig, Bob Feller, Elson Howard, Gabby Hartnett, Herb Pennock, Mike Schmidt and Pete Rose! Also, find Fielding Gloves, Batting Gloves and Sweatbands sequentially numbered to 5 or less, of players like Kris Bryant, Byron Buxton, Kyle Schwarber, Ken Griffey Jr. Barry Bonds, Tony Gwynn, Mike Schmidt and Willie Stargell! - Find the all-new 42 Tribute paying respects to the great Jackie Robinson! This insert features game-used material straight from an April 15th game when teams paid homage to Jackie's big-league debut in 1947! Find these players and more: Jorge Soler, Andrew McCutchen, Starling Marte, Josh Harrison, Jacob deGrom, Eric Hosmer, Jose Bautista, Josh Donaldson, Joey Votto, Troy Tulowitzki, Paul Goldschmidt, Matt Kemp, Torii Hunter, all sequentially numbered to 99 or less with a prime parallel sequentially numbered to 10 or less! 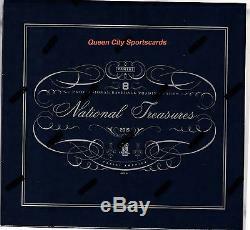 PRODUCT DESCRIPTION BASE CARD 2015 National Treasures delivers a large base set that includes 150 Base Cards. Find new names like Babe Ruth, John McGraw, Moose Skowron, Johnny Sain, Bob Turley and Frankie Crosetti along with other top names from today and yesterday! Find parallels featuring prime, laundry tag, brand logo and button swatches from game-used jerseys, sequentially numbered to 25 or less! Find Career Year parallels, highlighting each players most memorable season! ROOKIE MATERIAL SIGNATURES Look for the top 2015 rookies with a jumbo piece of jersey and on-card signature! Find Kris Bryant, Joc Pederson, Yasmany Tomas, Maikel Franco, Chris Heston, Matt Duffy, Addison Russell, Byron Buxton, Jung-Ho Kang, Noah Syndergaard, Raisel Iglesias, Javier Baez, Francisco Lindor, Rusney Castillo, Jorge Soler, Keone Kela, Preston Tucker, Carlos Rodon, Kevin Plawecki, Steven Matz, Billy Burns, Eddie Rosario, Jose Pirela, Taylor Jungmann and Paulo Orlando, sequentially numbered to 99 or less! LEGENDS CUTS BOOKLETS Look for Kirby Puckett, Billy Martin, Satchel Paige, Bob Feller, Jackie Robinson, Roberto Clemente, Bobby Thomson, Ty Cobb, Ted Williams, Burleigh Grimes, Lou Gehrig, Warren Spahn, Charlie Gehringer, Dizzy Dean, Mel Ott, Duke Snider, Enos Slaughter, Frankie Frisch, Gabby Hartnett, Gary Carter, Gil McDougald, Pee Wee Reese, Harmon Killebrew and others! All are sequentially numbered to 25 or less! COMBO MATERIALS BOOKLET Look for All-Star pairings with Combo Materials Booklets. Find combinations like Kris Bryant/Kyle Schwarber, Xander Bogaerts/Mookie Betts, Jose Abreu/Yasmany Tomas, Edwin Encarnacion/Josh Donaldson, Byron Buxton/Miguel Sano, Yoan Moncada/Jorge Soler, Joe Torre/Tommy Lasorda, Andy Pettitte/Wade Boggs, Mark McGwire/Jose Canseco, Stephen Strasburg/Max Scherzer, Bo Jackson/Deion Sanders and Michael Young/Adrian Beltre. Collect parallel versions with on-acetate autographs of each player, sequentially numbered to 10 or less! ALL-STAR QUADS Look for jaw dropping combinations of All-Star ballplayers. Find single, combo, triple and quad All-Star versions with prime parallels of each! Find combinations like Harper/Bryant, Pujols/Trout, Bautista/Donaldson, Panik/Bumgarner/Posey, Perez/Molina/Posey, Bryant/Trout/Harper, Pederson/Panik/Bryant/Arenado. FIELDING GLOVES One of the industries most sought after memorabilia pieces will debut in 2015 National Treasures! Find prime leather pieces from players like Griffey, Willie Stargell, Barry Bonds, Kris Bryant, Miguel Sano, Joc Pederson, Byron Buxton, Corey Seager, Francisco Lindor, Aaron Judge, Javier Baez, Addison Russell, Yasmany Tomas and Kyle Schwarber! All are sequentially numbered to 5 or less! FLAG SILHOUETTES Find game-used Flag patches with an amazing checklist featuring: Carlos Correa, Barry Bonds, Luis Severino, Omar Vizquel, Andres Gallaraga, Cal Ripken, Juan Gonzalez, Mark Buehrle, Steven Souza, Maikel Franco, Lance McCullers, Matt Duffy, Preston Tucker, Jung-Ho Kang, Michael Taylor, Michael Lorenzen, Adam Jones, Dalton Pompey and Joey Gallo! SILHOUETTE AUTOGRAPHS The Silhouettes are back for 2015! Find top names like Adrian Beltre, Anthony Rizzo, Barry Bonds, Cal Ripken, Carlton Fisk, Corey Seager, David Ortiz, David Wright, Eric Hosmer, Felix Hernandez, Frank Thomas, George Brett, Jose Altuve, Will Clark, Josh Donaldson, Josh Harrison, Ken Griffey Jr. Kolten Wong, Kris Bryant, Manny Machado, Mariano Rivera, Mark McGwire, Mike Schmidt, Mookie Betts, Nolan Ryan, Reggie Jackson, Roberto Alomar, Robinson Cano, Roger Clemens, Slavador Perez and Sonny Gray! Find parallels that feature jumbo bat pieces, prime, laundry tag, brand logo, Cool Base tag and 1-of-1 signed Printing Plates of each! BAT BARRELS Chase the almighty, sequentially numbered 1-of-1, Bat Barrel nameplates! Look for Eddie Collins, Frank Chance, George Case, George Kelly, George Sisler, Harvey Kuenn, Honus Wagner, Joe DiMaggio, Johnny Mize, Lloyd Waner, Paul Waner, Ron Santo, Ted Williams, Tris Speaker, Ty Cobb, Willie Keeler, Kris Bryant, Carlos Correa, Yasmany Tomas, Al Simmons and Bob Meusel, numbered to 1! Also find 1-of-1 Bat Knobs, featuring 25 of the games greats! If you do not receive the per box hits described above, you must directly contact Panini for replacements, as there is nothing I can do once the box has been opened. Please contact me for any additional information or photos. The item "2015 Panini National Treasures Baseball Factory Sealed Hobby Box" is in sale since Thursday, December 24, 2015. This item is in the category "Sports Mem, Cards & Fan Shop\Cards\Baseball". The seller is "qcsportscardsnet" and is located in Charlotte, North Carolina.